The Château de la Noblesse extends continuously over approximately 14 hectares, exposed to the rising sun. The soil is clayey and chalky (the origin of the name of the communal road), which means that the soil must be worked at the right time. (The soil must not be too wet as it will stick to the implements, nor too dry or it will become rock hard.) It is necessary to plough frequently in Summer, otherwise there is too much evaporation from the cracks in the earth due to its retractation. MOURVEDRE (a Spanish variety with small grapes and a thick skin, which contains a great deal of anthocyanines and tannins), which appreciates the heat and humidity of the night. It contributes tannin and colour. 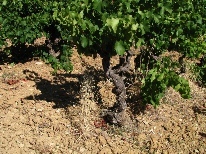 GRENACHE (a typical variety of Château Neuf du Pape), which is a variety with small grapes contributing alcohol and mellowness. CINSAULT, which is a fairly large grape contributing to fruitiness and fragrance. La Clairette : which is the main ingredient of our white Bandol. It contributes mellowness and the fragrance of acacia. White Ugni brings a touch of acidity, which prevents the wine from being flat and increases the freshness of Château de la Noblesse. Rolle, a minor vine, which brings flavours of flowers and fruit. It is also called Vermentino. Situated in the basin of Le Beausset, we benefit from a maximum of sunshine with very little rain, which means that the vintners must work the soil or remove some of the grapes at the beginning of Summer (green or unripe grape harvest), in order to prevent the vines from suffering and to enable them to bring their grapes to maturity. Stocked, for 18 months minimum, in barrels in the 18th century vaulted cellar of the Château de la Noblesse. The red wines mature very well. They can remain in your temperate cellar for several years.